Is your school "Sec-curity Safety Center "a licensed school? We encourage everyone to send an email, use the support chat to get further help. The New York State Department of State Division of Licensing Services is responsible for issuing the New York State Security Guard License. Be a citizen or resident alien of the U.S. Pass an FBI background check with no serious convictions or felonies. An 8 Hour Pre-Assignment Certificate of Completion which will be issued the same day, upon completion of the class. An Application fee in the form of a money order or cashier’s check, made out to NYS Department of State. Please click here for further clarifications on – How to Become a Security Guard (NYC). Where can I get Security Guard application forms? 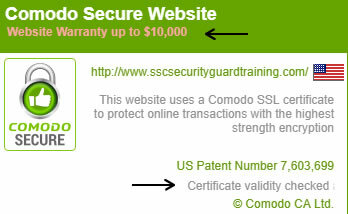 How much does it cost to get the security guard license? Do I need to be fingerprinted again if I already have one on file? Are certifications in other states valid in New York? No, the certifications from other states are not recognized by New York State for the purposes of security guard licensing. Renewing Expired/Expiring Security Guard License? Two months before your License expires, The Division of Licensing Services (DOS) will send you a renewal reminder letter by physical mail to your address on file (Please make sure your address is the current one). The renewal reminder form will contain the necessary information about fees, courses and processes you need to complete. If your license has expired, you are required to renew your license within six months of expiration, being the grace period allowed by the The Division of Licensing Services (DOS). However , if your license has expired over the granted six months grace period, you will be required to apply for a new one by going through the process of fingerprint registration and and to submit a new application to receive a new license. Can I get a new copy if I lost my certificate? Can I just show up to the center for the class? We welcome walk-ins!. However please be advised that if classes are full you will not be able to attend on that day. What must I bring to classes? A Government issued Picture ID (Government Issued Photo ID Or School ID. Your Social Security Number. We do not require the actual card, just make sure the number is correct. A copy of your receipt. If you don’t have access to a printer, take a picture on your phone and we will accept that as proof of payment. What if I missed my Annual from last year? You are required to take the 8 Hour Annual In Service Training Course every year, as such if you missed it, you will still need to complete the program by registering for two sessions. You will be required to sit in for these courses either on the same day or to break it down to two days of lecture. If you are late or cannot make it you will be scheduled in to take the next available class at no charge, however there is no guarantee of free spaces, please call to confirm availability. How long will it take you to send the information in to the state after I take the 8 Hour Annual In-Service Training Course with you ? We aim to get your paperwork as quickly as possible. ALL security training schools are given 7 days to get the paperwork to the state. Our goal is to make sure you complete your process without any delays, as such we aim to send your paper work in as little as 24hrs. Once it gets to the state, it will take them about 2 weeks to actually process it in their system. Do I need to be present for the full duration of the class to be issued my certificate? It is mandatory by law that you attend the full duration of the class in order to be eligible for a certificate. If you are late or cannot attend on the class, we will allocate a new slot on the next class at no extra cost. I had a license a long time ago, what do I need to do get my certificates re-issued? Contact the licensing departmentas they will have on record your 8 and 16 Hour information in the system. Once you have been a licensed security guard, even if it was a long time ago, all you need to do is is get re-fingerprinted and send in a new application to receive a new license. Students will be entitled to a 100% refund at any time prior to the start of instruction. 16 hour OJT course: Student will be entitled to a 50% refund if the student cancels after the start of instruction, but before the start of the second 8 hour block of instruction. A DCJS approved security guard training school cannot assess any non-refundable registration fees, deposits, or cancellation fees. We believe that by choosing to train with us, you have entrusted us with your future. We will help you in your efforts find a job with employers we may refer you to, but as no one can guarantee a job placement, we are not able to make a job promise to you. Our sister company is a Security firm which is always hiring too, so we will send in your application once you take the course for consideration for the next available position. Any incident that occurs at an approved security guard training school associated with mandated security guard training that results in or creates the potential for injury, property damage, situations of an emergency nature, or any other unusual occurrence must be reported by the school director to the SGP immediately via telephone and written correspondence. Notification must detail all pertinent aspects of the occurrence, to include but not limited to: accidents: injuries, whether the incident disrupted instruction or resulted in the inability to complete training; and a narrative detailing the sequence of events.